We love cooking and eating Mexican food, and guacamole is one of our favorites either as a dip or as an accompaniment to any Mexican dish. However, we have also gotten into the habit of making it every time we cook out on the grill. It just pairs up well with grilled meats. This is a very simple version, and I find it works best with picky kid palates. Mix all ingredients together, slightly mashing the avocado in the process. We like to leave some avocado chunks in our guacamole. Great to dip tortilla chips in or just a condiment for grilled meats. yumm. love guacamole too. and i like the acovados chopped/chunky not mushed like the ones in Mexican restaurants. As my memory serve me right- I only use avocado when making “ICE CANDY” or just itself with sugar and evaporated milk sometimes with sago and freeze it! 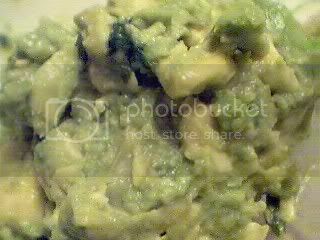 Guacamole is now one of my favorite a great condiments for Mexican dishes thanks for sharing!